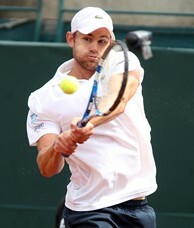 Andy Roddick has the second-most Davis Cup victories in U.S. team history. The USTA and U.S. Davis Cup Captain Jim Courier announced that world No. 9 Mardy Fish, No. 10 Andy Roddick, and the world’s top-ranked doubles team of Bob and Mike Bryan will represent the United States in the 2011 Davis Cup by BNP Paribas Quarterfinal tie against Spain, July 8-10. The tie will be played on an indoor hard court at the Frank Erwin Center at the University of Texas in Austin. Roddick, who is second all-time in U.S. Davis Cup history with 33 career singles wins, will compete in his adopted hometown of Austin for the first time, and the tie will also be Courier’s first at home as the U.S. Captain. Spain named world No. 6 David Ferrer, 2009 Australian Open semifinalist Fernando Verdasco, Feliciano Lopez, who will compete in the quarterfinals of Wimbledon tomorrow, and Marcel Granollers as its team for the quarterfinals. "Spain has been one of the top Davis Cup teams for a number of years now and we are excited to have the chance to compete against them in Austin in front of our home crowd," said Courier, who was named the 40th U.S. Davis Cup Captain in October. "Our team is looking forward to both the challenge and the atmosphere of the tie." Tennis Channel will provide live daily coverage of the event. This quarterfinal tie will mark the 10th matchup overall between the U.S. and Spain in Davis Cup competition. The U.S. leads the overall series 5-4, with its last victory coming in the 2007 quarterfinal in Winston-Salem, N.C. World No. 1 Rafael Nadal led Spain to a 4-1 victory in the last meeting between the two countries in the 2008 semifinal in Spain. The U.S. is 109-15 all-time in Davis Cup ties played at home and 209-64 in Davis Cup play overall. The U.S. owns the longest uninterrupted run in the World Group, dating back to 1989. Should the U.S. defeat Spain, it will face either Germany or France in the semifinals, September 16-18, in a tie guaranteed to be on the road under the competition’s alternating home-away format. The opening day of play in the best-of-five match series features each country's No. 1 singles player against the No. 2 player from the opposing country. The pivotal doubles match is played Saturday, followed by Sunday’s "reverse singles," starting with each country’s No. 1 player squaring off followed by the No. 2 players in the fifth and final match. Fish, 29, is 6-5 in Davis Cup singles play and will compete as the U.S. team’s No. 1 singles player for the just the second time in his career. In the 2010 World Group Play-off against Colombia, Fish, playing at the No. 1 position, became the first U.S. player to win three live rubbers in a single tie since Pete Sampras in the 1995 final, as he played more than 11 hours of tennis and won two five-set singles matches and a five-set doubles match with John Isner. He also helped the U.S. reach the 2004 Davis Cup Final, where it lost to Spain, and that same year, he won the silver medal at the Olympics in Athens. Fish is currently a career-high No. 9 on the ATP World Tour. Roddick, 28, holds a 33-11 record in Davis Cup play (all singles matches) and is second all-time with most U.S. Davis Cup singles victories, behind John McEnroe’s 41. In 2007, Roddick led the U.S. to its first Davis Cup title since 1995 when they defeated Russia in the Final. He has competed in 24 total ties (tied for second all-time among U.S. players) and has played in 44 total Davis Cup matches for the U.S. (tied for third all-time). He is also second all-time in most consecutive years played on the U.S. Davis Cup Team, competing for nine years from 2001-09 (tied with Todd Martin and behind McEnroe, who competed for 11 consecutive years). This will mark just the third tie in his illustrious career that Roddick is not the No. 1 player for the U.S., the others being his debut at the 2001 Davis Cup first round at Switzerland and the 2002 Davis Cup first round win over the Slovak Republic (behind Pete Sampras) in Oklahoma City. Bob Bryan, 33, half of the world’s top-ranked doubles team, holds an 18-2 double record in Davis Cup and a 17-2 record with twin brother, Mike. He is also 4-2 in singles (all dead rubbers). The Bryans’ win at the 2009 Davis Cup first round versus Switzerland put them first all-time in U.S. Davis Cup history with 15 doubles wins as a team and they are the only brothers to pair in victory for the U.S. In July 2010, Bob and Mike broke the all-time Open era record of 62 team doubles titles after winning the Olympus US Open Series event in Los Angeles. They also captured the 2010 US Open doubles title and the 2011 Australian Open doubles titles, and have since won four additional titles to extend the record to 72. Mike Bryan, 33, holds an 18-2 record in Davis Cup doubles and is 17-2 record with Bob (Mike partnered with Fish in the 2008 semifinal against Spain). Mike played in 19 consecutive doubles match for the U.S. Davis Cup Team since he and twin brother, Bob, joined the team in September 2003 until suffering from food poisoning before the 2010 World Group First Round in Serbia (John Isner replaced Mike and teamed with Bob). The Bryan brothers currently share the No. 1 doubles ranking and finished five of the past six years as the top-ranked doubles team in the world. Founded in 1900, Davis Cup is the world’s largest annual international men’s team competition with 125 nations competing this year. The U.S. leads all nations with 32 Davis Cup titles. Wilson is the official ball of the U.S. Davis Cup Team.